The sedimentary rock used as a filter, absorbent, filler, abrasive, and more. Diatomite as a beer filter: Diatomite has a very small particle size, a high porosity, and is relatively inert. That makes it an excellent material for use as a filter. Much of the beer brewed in the United States is filtered through crushed diatomite, known as diatomaceous earth. 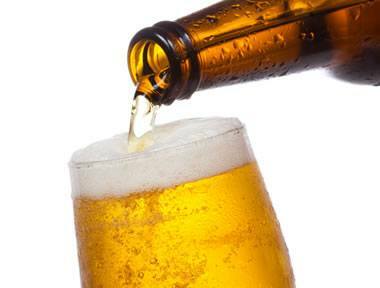 When selecting diatomite for beer filtering, it is important to source the diatomite from a deposit that was formed in a freshwater environment - because the salty marine diatomite will ruin the beer! Diatomaceous earth is also used to filter wine, drinking water, syrup, honey, juice, swimming pool water, and much more. Image copyright iStockphoto / nitrub. Diatomite is a friable light-colored sedimentary rock that is mainly composed of the siliceous skeletal remains of diatoms. It is a very porous rock with a fine particle size and a low specific gravity. These properties make it useful as a filter media, an absorbent, and as a lightweight filler for rubber, paint, and plastics. When diatomite is crushed into a powder, it is usually called "diatomaceous earth," or D.E. 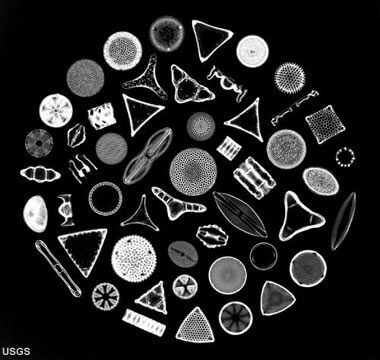 Diatoms are microscopic, single-celled algae that live in marine or fresh water. They produce hard parts made of silicon dioxide. NASA Image. Diatoms are members of a large, diverse group of algae that drift freely in the waters of oceans and lakes. A few types of diatoms live on the bottom of these water bodies and in soils. Most diatoms are microscopic, but a few species are up to two millimeters in length. As a group, diatoms are unique because they are single-celled organisms that produce an external cell wall composed of silica, called a frustule. These frustules are very thin and have a delicate structure. Nearly all diatoms are photosynthetic and live in water less than about thirty feet deep, where sunlight can penetrate. Diatoms are prolific and are responsible for producing nearly half of the organic mass in the world’s oceans. Their abundance and small size places them at the base of the marine food chain. Diatoms: This image illustrates the frustules of fifty different diatom species. These organisms are microscopic in size, and many of their frustules are a network of tiny pores and openings. This characteristic is what makes diatoms a perfect medium for filtering tiny particles from fluids at water treatment plants, breweries, food processors, chemical plants, and other facilities. Their delicate structure is also a reason why they are very soluble. Image by the United States Geological Survey. When diatoms die, their siliceous frustules sink. In some areas the frustules are not incorporated into the bottom sediment because they dissolve as they sink or dissolve while on the sediment surface. If the sediment is composed of over 30% diatom frustules by weight, it would be called a "diatom ooze" or a "siliceous ooze." 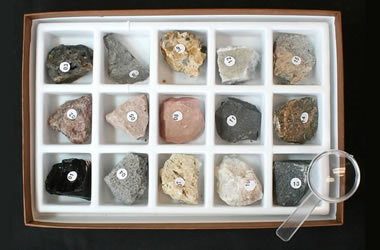 These are the sediments that are lithified into the rock known as diatomite. 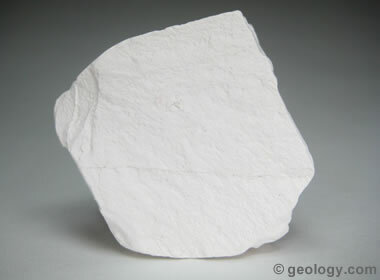 Diatomite: A specimen of white diatomite with a chalky texture from Nevada. Specimen is about 2 inches across. Diatomaceous earth: When the rock known as "diatomite" is crushed into a fine powder, the material is known as "diatomaceous earth." This is the material used by industry in filter media, manufacturing filler, abrasives, absorbents, and other products. This image copyright iStockphoto / MonaMakela. The small particle size of diatomaceous earth and the open structure of the frustules enable it to work effectively as a particle filter. The pores within and between the frustule are small enough to trap bacteria, clay particles, and other suspended solids. It is used at drinking water treatment plants, swimming pools, breweries, wineries, chemical plants, and where juices and syrups are made. These fluids are forced through a layer of wet diatomaceous earth, and suspended particles are trapped because they cannot fit through the pores. Diatomite is often used as an additive in the manufacture of portland cement. High-quality diatomite contains over 80% silica, and it is added to the cement-making process to boost the silica content of the product. Diatomite straight from the mine is crushed and blended with the limestone, shale, or other materials being used to make the cement. 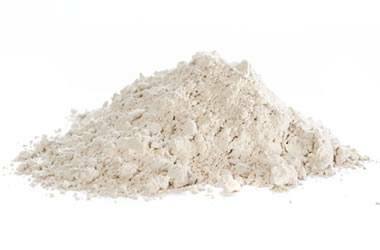 Diatomaceous earth is used as a lightweight, inert filler in some manufactured products. It is added to paint as a whitening agent and extender. It is added to plastics as a lightweight filler. It is used as a filler and anti-stick agent in asphalt shingles. It is used as a filler and to improve adhesion resistance in many rubber products. If dry diatomaceous earth is placed on a liquid spill, it can absorb and hold an amount of liquid equivalent to its own weight. This absorption facilitates containment, cleanup, and removal. Capillary action of liquids into diatomaceous earth is enhanced by its small particle size, high surface area, and its high porosity. These same properties make diatomaceous earth able to absorb skin oils when used in cosmetics and facial masks. Diatomaceous earth is an absorbent ingredient of some kitty litters. It is also used as a soil treatment to absorb and hold water. Diatomaceous earth is used as a mild abrasive in some toothpastes, facial scrubs, and metal polishes. Its silica particles are small, friable, have a high surface area, and are angular in shape. These are properties that help it perform well as a mild abrasive. Diatomaceous earth is used as a growing medium in hydroponic gardens. It is inert, holds water, and has a porosity that allows the soil to breathe. To help grain and other seeds from sticking together and remain dry, they are dusted with diatomaceous earth. Diatomaceous earth is an abrasive and an absorbent. These properties make it effective in controlling slugs and certain insects. To control ants, fleas, roaches, lice, mites, and ticks indoors, vacuum the infested area, then dust it with a small amount of diatomaceous earth. Repeat every few weeks until resolved. Dogs and cats can be treated with food-grade diatomaceous earth to control fleas and ticks. Before treating the pet, clean their bedding materials, and vacuum rugs where the pet is allowed to roam. Then lightly dust these areas with diatomaceous earth. Repeat every few days. Diatomite Producers: Twenty-nine countries produced commercial quantities of diatomite in 2017. Thirteen of those countries (the United States, Czechia, Denmark, China, Argentina, Peru, Japan, Mexico, France, Russia, South Korea, Turkey, and Spain) produced over 50,000 metric tons. Sixteen other countries produced less than 50,000 metric tons. Diatomite forms in marine water and freshwater environments. These origins are an important consideration when a diatomite source is being considered for use. Any use that will be associated with human, animal, or plant contact should come from freshwater deposits. Diatomite from saltwater sources can contain salts that can produce objectionable or toxic effects. Diatomite: Robert D. Crangle, Jr.; 2017 Mineral Commodity Summary; United States Geological Survey; January 2018. Pest Control with Diatomaceous Earth: Articles on the DiatomaceousEarth.com website, last accessed September 2018. Diatomite: Robert D. Crangle, Jr.; 2016 Minerals Yearbook; United States Geological Survey; June 2018. How Much Does Diatomite Cost?